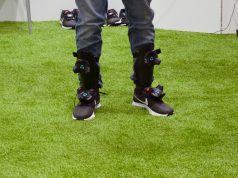 Today at CES 2017 HTC announced the Vive Tracker, a standalone tracking module that’s designed to attach to anything to become tracked in the virtual world. We heard at least as far back as the reveal of the HTC Vive headset back in 2015 that we might one day see a standalone ‘puck’ tracker using the tracking tech, and now it’s finally real. The Vive Tracker is a compact standalone tracking device made to bring real objects and third-party accessories into virtual reality. 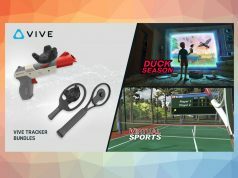 The Vive Tracker uses the same SteamVR Tracking technology that’s found on the Vive headset and controllers and is promised to have the same accuracy. The Tracker has an integrated battery, a microUSB port, and what appears to be a standard camera-type mounting screw. Like the Vive headset and Controllers, the Tracker has its own wireless connection to the computer. Thanks to the microUSB port, third-parties can send data about their accessories to the host computer, which means that button clicks, trigger pulls, and other events can be used without requiring a separate connection to the computer. With more than 20 tracking points on the device, the unit is designed to fit a wide range of uses while remaining compact. At the accessory’s reveal today, HTC showed how it could be integrated into a wide range of third-party products. 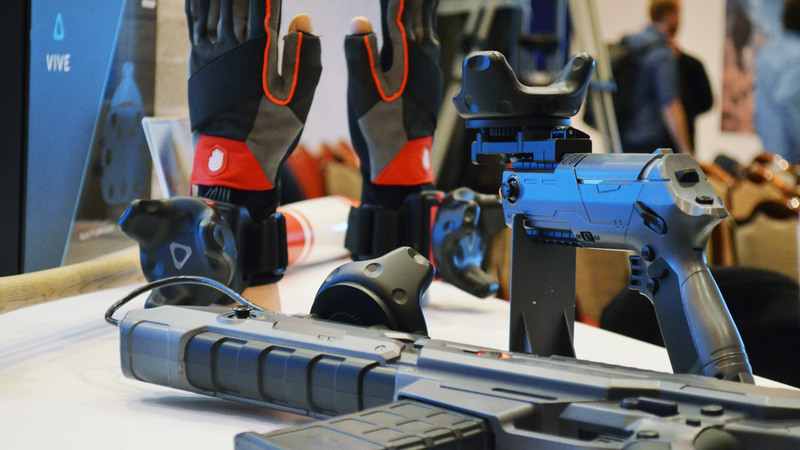 We saw everything from bats to guns to gloves and even a firehose simulator from partners who worked with HTC to make their accessories work with the Tracker. 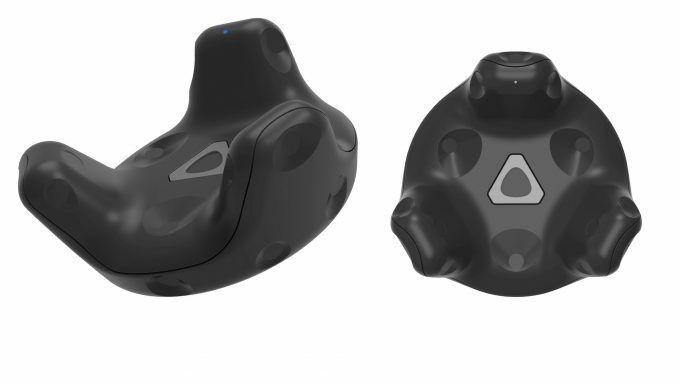 The Vive Tracker has not yet been priced, but given the similarity to the Vive controllers, we guess the Tracker will be priced around the same $130 mark. The Vive Tracker release date is in Q2 2017. Idiots. They will get obscured by clothing if you get them too close to your body! Mounted on input devices, they will be no more prone to occlusion than the wands are, and occlusion is not known to be a problem with the wands. Re: RockstarRepublic, I don’t understand what it is that you don’t understand. These are made to be bought by a customer in conjunction with a third party input device like a gun. The third party would design their gun with a slot into which to snap the tracked puck into, thus providing tracking for the gun. You could snap the tracked puck out of the gun and into a different third party input device as needed, thus meaning that you only need to have one or two of these to support a bunch of tracked (solid) input devices. They’re basically the same thing as the wands without the grip of the wand. So instead of having to snap your wands into a third party device, you snap these in. By the way, “snap in” might not be the right term … looks from the pictures like they may have a screw mount on one side so they’d be screwed into the tracked device. It should be pretty obvious what “I don’t understand”, which is not to be taken literally. These are massive attachments, which upon further inspection does not seem very well designed even with the intention of working with 3rd devices. The wands themselves are not very good. They get the job done, but most of the Vive and its peripherals (which I own) feel more like prototypes than well planned consumer ready hardware. There literally has to be a better way to approach this, along with a smaller form factor. Valve has a new set of light houses that are not only cheaper but but effective. Additionally, perhaps the solution is not to tack on fist sized pieces of plastic, but offer the sensors on a more component level. Their size is irrelevant when they are mounted on a rigid body in a position that the hand or arm is never meant to move through. Weight may be more of an issue, but they’re probably fairly light and the weight is likely to be offset by a lower than realistic weight on the rigid body of the tracked device. Having tracking sensors embedded in tracked objects would be more elegant but it is probably also more technically difficult and this HTC solution is just an additional mechanism for enabling tracked input devices. It has its advantages (pay for the expensive tracking and wireless hardware once, re-use it for many rigid input devices) and disadvantages (size, mostly). Size and accessibility are always relevant. Its why HMD manufacturers are working towards making their headsets smaller and lighter. If it didn’t matter, they wouldnt do it. I suppose the devices it attaches to, such as a gun, will still have to include some kind of wireless communication and battery so as to register input outside of tracking. If tracking the hands is important, having these on your wrist is just not acceptable. The newer prototype they showed off at the steam dev days had the right idea. Thin, curved surface on the back of the hand, grip controller floating in palm. If that could work with their prototype controllers, such “straps” can work with 3rd party peripherals imo. After using the Rift’s touch controllers, I am also convinced that you can get solid tracking thin curved form factor…. Perhaps the new lighthouses need to include a camera as well, or perhaps something else. This approach just doesn’t seem right. With all the competition on the horizon, I don’t think HTC has the luxury be sloppy with this stuff. The tracker has a micro-USB port that will be used to send inputs to the computer. The device will plug into the tracker and the tracker will send input data and whatever else. 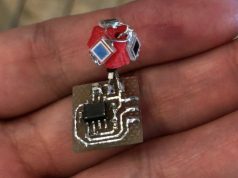 More expensive third party accessories will probably use Valve’s Lighthouse sensors that can be put all over the device without a tracker stuck on top. Valve has component-level sensors. Companies can use Valve’s tracker kits to make devices that are tracked all over. Exactly. It’s a great idea that will dramatically increase the number of cheap tracked objects. Haha, good point, though bear with me on this one.. I was imagining a multi-gun setup where holstering your side-arm would be required. That poky thing might get in the way, though I’m sure a magnetic holster or something would mitigate such issues. Way too early on for me to be concerned about such things really; Q2 will be interesting. I have to ask… Anyone know what the gun controllers are in the article pictures? They don’t look half bad! Is there a tracked cup in the works- you know, for drinking something? I don’t have a headset(I have 3 but not vive or rift), but I know I like snacks when I play vids, and VR isn’t quite so relaxing in that way. Great idea? Already out there? Or is there a better solution already available (like take off the headset haha)? I think the point of this accessory is you can attach it to pretty much anything. Even your cup. Well first thoughts are they look a little large.. but then they’ve got a battery in them… so fair enough… These should make for better rigging when filming mixed reality videos as we could simply screw the Vive tracker into our cameras cage (which typically has a lot of mounting points). Much better than our current Duct tape and velcro strap option. People seem to be assuming it’s a consumer product, but at the moment it’s not totally obvious how useful this would be. Just because you can stick it to your cup/chair/keyboard doesn’t suddenly mean you’ll be able to see it in any game. At the very least every game would need to add support for the trackers which makes me think it’s more aimed at developers to integrate with. However… if they’re integrated at the SteamVR level then I suppose it’s likely that you could attach it to your cup (or whatever) and via the SteamVR settings you get to choose a model that represents the item you’ve attached it to (and tweak positioning) and then it gets overlayed into the game – just like how sometimes we see our controllers glitch out and appear in game rather than the games hands. My main concern about these is that I haven’t heard anything about multiple device support. At first glance, that seems like a dumb thought, since one would assume the whole point of these is to add additional tracked items. But so far my understanding of the Vive controllers themselves is that using more than two isn’t supported without having to resort to hacky methods. If there weren’t any hardware issue with tracking more than two controllers, I would have expected there to be official support by now. I’d like to see some proof that these devices can be tracked at the same time as both of the Vive controllers. An official statement about the number of simultaneously tracked devices would be nice. Otherwise, I’d settle for a video showing something like a player using both controllers while also wearing body-mounted trackers. These trackers will be a lot less interesting to me if they can’t be used at the same time as both controllers, since I’d like to experiment with them for torso and foot tracking. In this topic on the subject, a Valve developer mentions only being able to connect two controllers to a headset. I see thanks. I didn’t realize that. Seems like a strange limitation. Thank you! That’s exactly the sort of information I was looking for! It’s a bit annoying that each tracker will require its own dongle, but I suppose a quality USB hub will take care of that. That’s just nonsense. Of course you can track more than one object. In fact, the controllers themselves are already two objects. And maybe you don’t realize this, but the way the tracking work is that the objects track themselves.There is no hardware limitation. He’s actually half right. The controllers are wireless because they talk to the headset wirelessly, BUT it can only communicate with 2 controllers at a time. People HAVE used extra controllers (mainly for making mixed reality videos) by plugging the controller in with a long USB, and/or by flashing a steam controller dongle with firmware that allows it to talk to the Vive controllers wirelessly. All that means is that basically, this thing will require a dongle (which i’m sure it will ship with) plugged into your PC if you want to track it and the controllers at the same time. I just hope that one dongle can handle 2 extra trackers (although it wouldn’t be a huge dealbreaker if not–just annoying). I never disputed the ability to track two objects. But as Adam Finch explained, tracking MORE than two objects requires using very hacky, consumer-unfriendly methods. I realize that each object tracks itself, but at some point it has to provide positioning information to the computer, and there’s no guarantee that there’s an “unlimited” number of wireless connections. For example, I’ve owned a few high-end Bluetooth headsets for making hands-free phone calls, and they’ve had the ability to pair the headsets with exactly two devices. If I want to pair to a third device, it won’t let me do it without losing one of the previous two pairings. So there is precedence for certain types of Bluetooth devices to support a very limited number of pairings. Based on what I’ve read, the Vive doesn’t seem to be able to communicate with three or more controllers. What Adam Finch said regarding flashing a Steam Controller dongle or connecting the controllers with USB cables is what I’ve found when looking up the use of three or more controllers. While it seems likely to me that they’d include a dongle to allow additional devices to be connected, I’d like explicit confirmation, since there are use cases (out-of-home VR, for instance) where the trackers could very well get used in place of the Vive controllers instead of alongside them. The current upper limit of tracked devices is 16 so your worries are of no worry. But isn’t that in software? For instance, USB is supposed to support 127 devices on a single host controller, but good luck finding a computer that has much more than a dozen USB ports on it. Getting anywhere near a 127-device limit requires buying more hardware. Well, I read a review where the Rift room scale struggles with 4 trackers due to USB limitations on the PC used. So perhaps the Vive tech is good but there may well be other issues outside of it. What about current iteration ??? when testing these trackers (or any tracker) try to move your head and controller in 2 directions: perpendicular to the line of sight to external tracking basestation and parallel to that line..